Cub Scout popcorn sales don’t just raise money for your pack. They also give your son opportunities to practice important life skills. Selling Cub Scout popcorn is a great way for a pack to earn money for its activities while teaching the boys that we earn our own way. Now, I know some people don’t like to sell popcorn for a variety of reasons. But your son can practice some valuable skills during your pack’s popcorn sale. Recently, we had a “show and sell” event where we set up a table at Lowe’s and sold popcorn to people coming in and out of the store. During our shift, I started thinking about what Grant was learning through this process, and I realized that there are some great lessons to be learned by selling Cub Scout popcorn. The boys would love dressing up in this popcorn costume for the show and sell! 1. Goal Setting Skills – Grant’s goal this year is $7,000. Where did he get that number? I have no clue. Why did he set such a high goal? I don’t know that either. The most he’s ever sold in a year is about $1,500. Grant won’t sell $7,000, but so far, he’s sold over $3,100–double his previous record. He’s doing that because HE set the goal and HE wants to work toward it. Most packs usually give prizes to boys depending on how much Cub Scout popcorn they sell. The prize your son wants can be his goal. Just make sure that it is something that he picks out by himself. Your Cub Scout might not make his goal, but I’ll bet he works hard at trying to! 2. Persuasion Skills – Because the popcorn is a bit on the expensive side, a boy has to be persuasive. In our pack, the boys are taught to say, “Would you like to support Scouting by buying some popcorn?” He’s selling support of a great organization–not just some popcorn. I admit, I was skeptical of this approach at first, but it works. Part of being persuasive is overcoming objections. When someone tells Grant that they don’t have any cash, he tells them that we can take debit and credit cards through our Square account. If they don’t eat popcorn, he asks them to make a military donation. When they say it’s expensive, he tells them that over 70% of the price stays in our area to support local scouting. Even if your son doesn’t grow up to be a salesperson, persuasion skills are necessary for almost every job. 3. Handling Rejection Skills – Yep, those little guys are going to be turned down. They will knock on doors where no one is home. Sometimes at show and sells, they’re going to be ignored. So, they will get a lot of practice handling rejection. When we don’t sell much Cub Scout popcorn, Grant will say, “It’s a slow night,” but he usually doesn’t complain about it. I think that’s because he’s been told no many times before, so he realizes that getting upset doesn’t change anything. 4. Perseverance Skills – Selling popcorn is a huge lesson in perseverance. If you don’t sell at this house, you just go on to the next house. If that person leaving the store doesn’t stop and buy, you just ask the next person. Being tenacious is important–it’s what gets you through big school projects and big work projects. You may have to walk him through some of these, especially if he’s a younger Scout. Not only is he practicing his math, he is also seeing how we use math in everyday life. I love that selling Cub Scout popcorn is helping my son learn some great life skills! 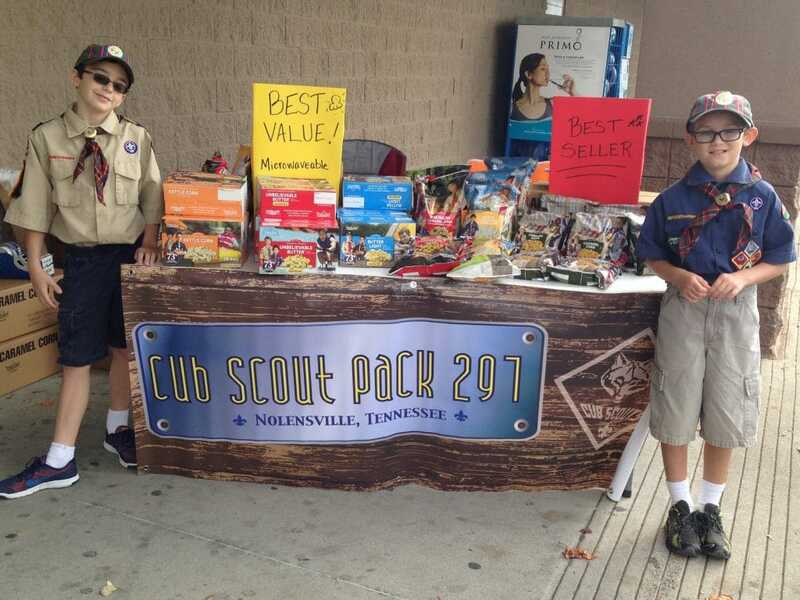 What has your Cub Scout learned through selling popcorn? P.S. Want to read about some fun popcorn games that are perfect for a pack meeting? Click on over and check them out! Sharing this on our Pack’s Facebook page! Great article!